Happily Ever After: IVF/ICSI #4 has officially begun! IVF/ICSI #4 has officially begun! Well Here is my pharmacy. It includes 4 boxes of 450iu Gonal F pens from my last IVF. I'm missing 2 boxes of Ganerellix that will arrive on Tuesday. Oh and I didn't even try to put in all the needles I have from my past IVF's. I have WAY to many. 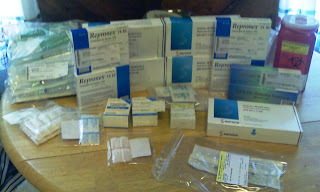 And of course precision rx sent me a crap load of needles this time. Needles I'll probably never use. Then again if I get pregnant I'll need them for the pio shots so I guess it's good I have them. I also have a box of Lupron unused that I'll never use as well as some crinone I'll never use again (got AF 12 days past my retrieval when I was on it). This is after 25 days of the BCP. I've never been on the pill for more then 21 days so I'm wondering if my body is confused and AF won't come. FYI today is day 3 of no BCP and no sign of AF. Usually AF comes by day 4 of no BCP so she should be here tomorrow. My clinic counts today as CD 2 though. E2 under 20 -their lab must measure hormones on a different scale. My E2 was never under 40 until I switched to this clinic. lining-5.3 --this must be because I haven't bled yet....seems kind of thick for the beginning of a cycle. Thursday AM b/w and u/s. I sure hope the Repronex does the trick and helps with egg quality! Some RE's say adding it to early can cause you to have worse egg quality. We shall see I guess. Then again this same clinic said they start the Ganerellix a lot earlier in your cycle so your eggs aren't introduced to the male hormones in your body...which can also effect egg quality. They say waiting till the follies are 14mm (which my RE is doing I think) is to late. I sure hope he starts me on the Ganerellix earlier since he is giving me 75iu of LH! Why can't it ever be easy?